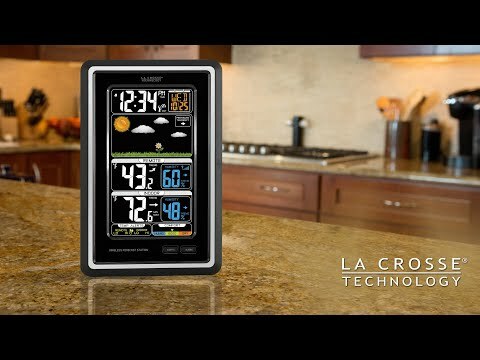 La Crosse Technology® introduces a Wireless Color Weather Station with precise, real-time backyard weather. New - Indoor Comfort Meter monitors indoor humidity (GOOD, HUMID, or DRY) for ideal comfort. Animated color forecasts with trends react to changing barometric pressure. Monitor IN/OUT temperature trends and set high/low temperature alerts. Measure indoor/outdoor temperature and humidity with daily MIN/MAX records -- all on one easy-to-read color display with adjustable brightness.